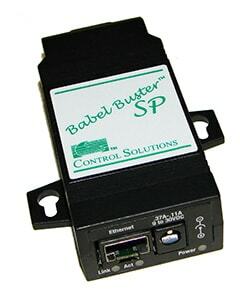 The Babel Buster SP Custom proprietary protocol to BACnet IP gateway lets you create your own gateway. 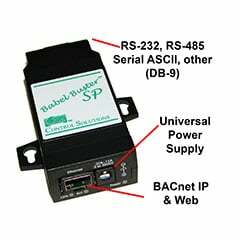 Designed to interface devices with a proprietary RS-232 or RS-485 ASCII protocol, the proprietary part of the protocol is user programmed using the built-in Script Basic. Simple function calls are provided to move data between your Basic program and BACnet IP objects. The BACnet IP side of this gateway is the same as our other BACnet IP gateways, and is configured via the internal web server. 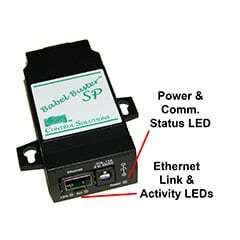 Babel Buster SP Custom is the ultimate "universal" BACnet IP gateway. 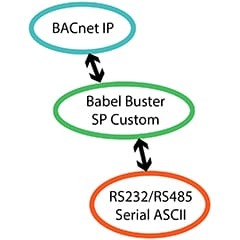 You write your own Script Basic program to communicate via RS-232 or RS-485 serial, or via TCP socket connection, to your non-BACnet device. Translate your data as needed, then place that data into BACnet objects accessible to any BACnet IP Client. The SP Custom includes its own internal web server that provides a web based user interface for configuring the SP Custom. Configuration is done using simple templates, and each web page has an online help section at the bottom. 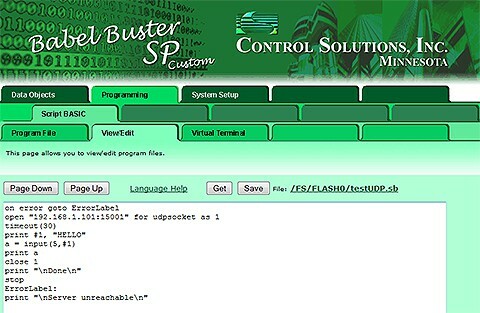 Click on any of the links below to view a demo copy of the entire Web UI in the BB2-7010.